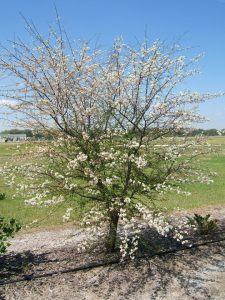 Pruning is one of the most controversial aspects of maintaining crapemyrtle. Traditionally, many crapemyrtles are routinely topped, leaving large branch and stem stubs. 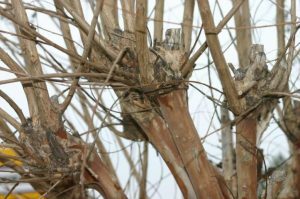 This practice has been called “crape murder” because of the potential impacts on the crapemyrtle health and structural integrity. Topping is the drastic removal of large-diameter wood (typically several years old), with the end result of shortening all stems and branches. Hard pruning (topping) stimulates crapemyrtle sprouting from roots, upper stems, or the base of main stems. If basal and root sprouts are not removed, one or more may form woody stems that eventually compete with existing main stems. These additional or competing stems may result in poor form and structure, such as stems that rub against each other. Topping typically delays flowering up to one month compared to unpruned crapemyrtle. 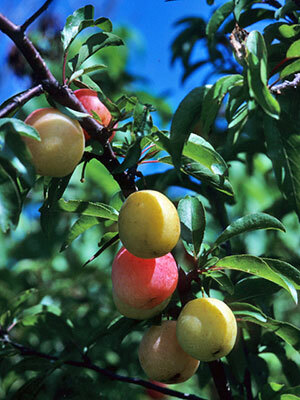 On some cultivars, topping also shorten the season of bloom. Long-stem sprouts emerge just below large-diameter cuts that result from topping. These sprouts usually develop into upright, unbranched stems that eventually flower, often bending under their own weight. Rain or wind storms can cause extreme bending and some will break because they are weakly attached to the main stem. Topping removes large amounts of starches and other food reserves stored within branches. Topping dramatically reduces the size of the plant canopy, ultimately decreasing the plant’s ability to produce food (starches) through photosynthesis. The large branch stubs caused by topping result in large areas of exposed wood that allow access by insects and wood-rotting organisms, weakening the plant’s structure. Finally, topping results in many dead stubs throughout the tree. Proper pruning may be needed, just like any other tree. Lower limbs of crapemyrtle are removed to increase clearance for pedestrians or vehicles. Stems are cut to increase branching. Other pruning may be conducted to direct growth away from structures, stimulate flowering, and remove spent flowers, seed capsules, and dead or damaged branches and twigs. 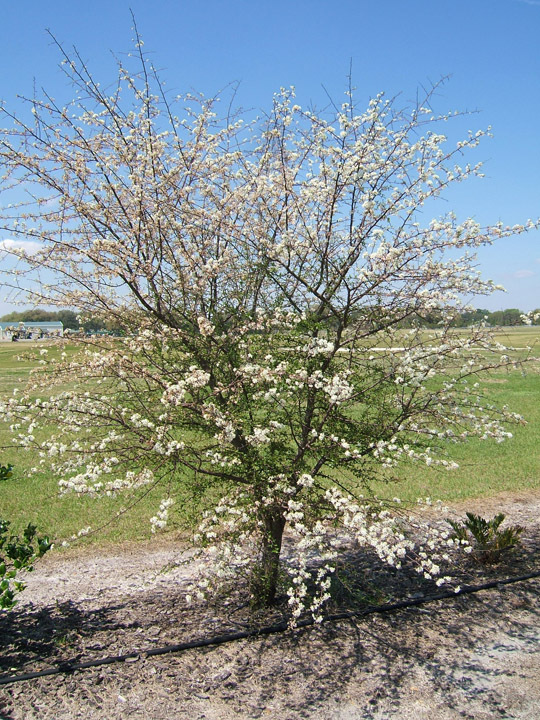 Properly placed, crapemyrtle is a low-maintenance plant needing little or no pruning. 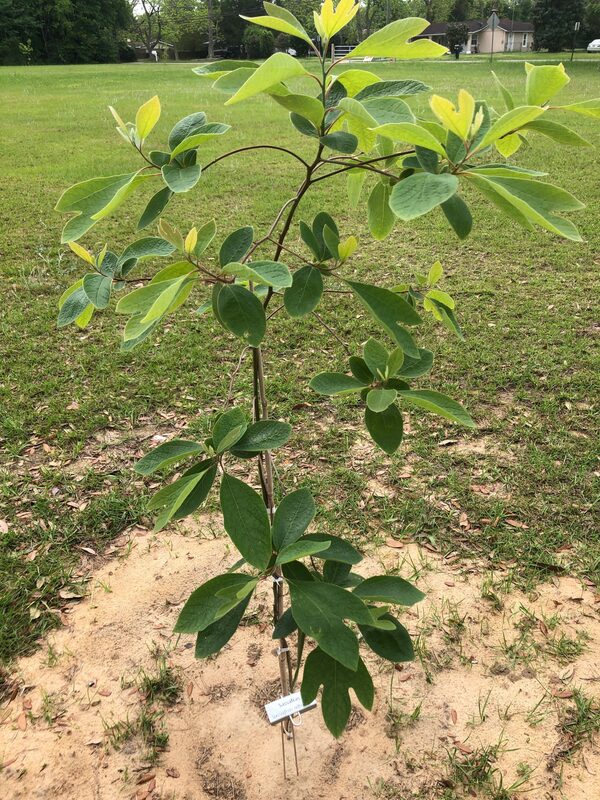 Problems with overgrown, misshapen, or misplaced crapemyrtle can be greatly reduced with proper selection of crapemyrtle cultivars, proper plant selection at the nursery, and proper placement in the landscape. For more information on cultivar selection go to: http://edis.ifas.ufl.edu/mg266. Pruning for safety may be done anytime. This may involve removing damaged or weak branches or pruning lower limbs for pedestrian and vehicle clearance and visibility. Pruning to improve plant structure, redirect growth, or alter plant shape and appearance should occur when plants are leafless and dormant–typically December through February. Although this can be accomplished at any time, without leaves, the branching structure is clearly visible to more easily determine appropriate branches for pruning. Prune to remove crossing or rubbing branches. Prune dead, damaged, or diseased branches at the branch collar. Remove vigorous branches growing toward the center of the canopy. Severe pruning should be performed late in the dormant period. Pruning too early might stimulate new growth that could be damaged by low temperatures. Arbor Day has a 145-year history, started in Nebraska by a nature-loving newspaper editor named J. Sterling Morton who recognized the many valuable services trees provide. The first Arbor Day was such a big success that Mr. Morton’s idea quickly spread nationwide–particularly with children planting trees on school grounds and caring for them throughout the year. Now, Arbor Day is celebrated around the world in more than 30 countries, including every continent but Antarctica. We humans often form emotional attachments to trees, planting them at the beginning of a marriage, birth of a child, or death of a loved one. Trees have tremendous symbolic value within cultures and religions worldwide, so it only makes sense that people around the world have embraced the idea of celebrating a holiday focused solely on trees. In addition to their aesthetic beauty and valuable shade in the hot summers, trees provide countless benefits: wood and paper products, nut and fruit production, wildlife habitat, stormwater uptake, soil stabilization, carbon dioxide intake, and oxygen production. New research is even showing that trees can communicate throughout a forest, sharing “information” and nutrients through a deeply connected network of roots and fungi that can increase the resiliency of an entire forest population. 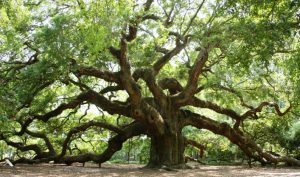 And if you’re curious of the actual dollar value of a single tree, the handy online calculator at TreeBenefits.com can give you an approximate lifetime value of a one growing in your own backyard. The Live Oak (Quercus virginiana) is one of the most iconic figures of the Deep South. 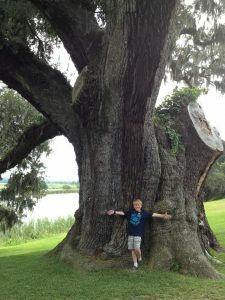 Mentioning the words Live Oak invokes all sorts of romantic nostalgia of yesteryear and the reputation is not unearned. 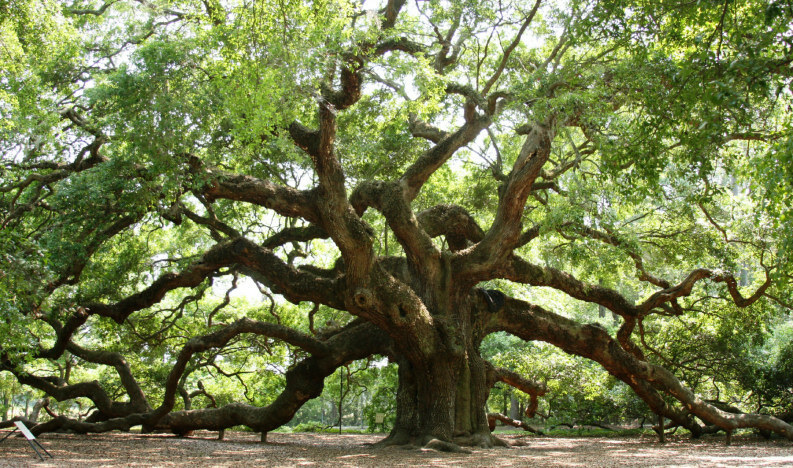 In fact, many Live Oaks still stand that were growing on American soil when the first English settlers set foot on Plymouth Rock. They are long-lived, picturesque trees that also happen to be nearly bulletproof in the landscape. Given these factors, it is not surprising that Live Oak is far and away the most common tree included in both residential and commercial landscapes in the Coastal South. 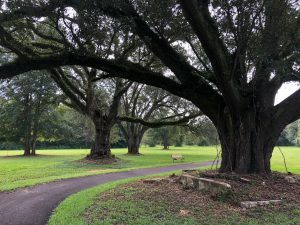 However, even the venerable Live Oak is not without its problems; this article will discuss a few of the more common issues seen with this grand species. 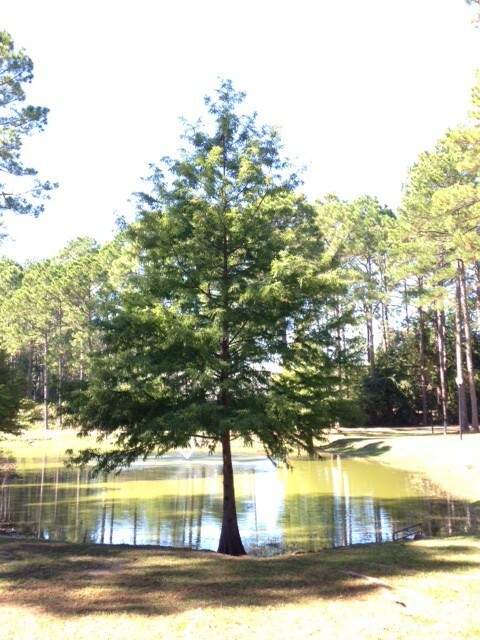 Remember to always plant trees a little higher than the surrounding soil to prevent water standing around the trunk or soil piling up around it, both of these issues frequently cause rot to occur at the base of the tree. If planting a containerized tree, remember to score the rootball to prevent circling roots that will eventually girdle the tree. If planting a B&B (Balled and Burlap) specimen, remember to remove the strapping material from the top of the wire basket, failure to do this can also result in the tree being girdled. Galls are cancerous looking growths that appear on the leaves and twigs of Live Oak from time to time and are caused by gall wasps that visit the tree and lay their eggs inside the leaf or stem of the plant. 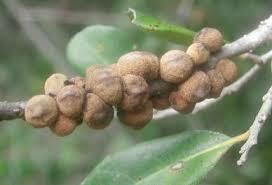 The larvae hatch and emerge from the galls the following spring to continue the cycle. These galls are rarely more than aesthetically displeasing, however it is good practice to remove and destroy gall infected stems/leaves from younger trees as gall formation may cause some branch dieback or defoliation. Chemical control is rarely needed or practical (due to the very specific time the wasps are outside the tree and active) in a home landscape situation. 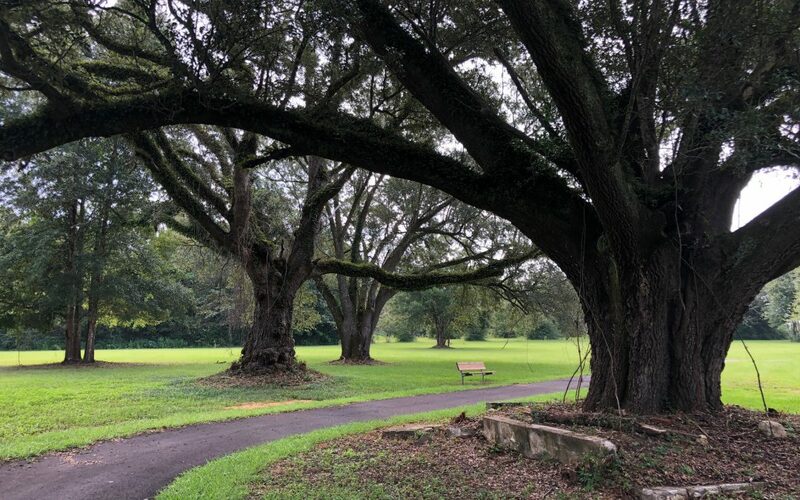 In conclusion, though there are a few problems that can potentially arise with Live Oak, its premier status and continued widespread use in the landscape is warranted and encouraged. It should be remembered that, relative to most other candidates for shade trees in the landscape, Live Oak is extremely durable, long-lived, and one of most pest and disease free trees available. Happy growing! 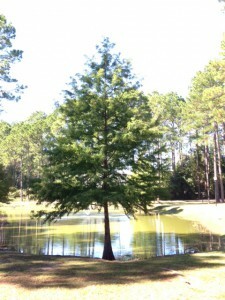 The cooler weather in the wintertime makes it a great time to plant trees and shrubs. That is why Arbor Day in Florida is the third Friday in January. In 2016, that event is January 15. Start your planning now with doing a site assessment on your landscape, then choosing the right trees and shrubs for your particular environmental conditions. And if you want to find out just how much your established trees are worth, use this National Tree Benefit Calculator!